To create the right door frame, you’ll need to know the measurements of the door you’re going to install. With a measuring tape, measure the width and the height of your new door. Then, add two inches to the width and 1 ½ inches to the height. These will be the measurements you use to create your door frame. Start by using a saw or circular saw to cut a top plate as wide as the rough door opening. Nail it into the ceiling joists. Then, cut a sole plate that’s also as big as the rough door opening. Nail it into the floor joists, however, don’t nail it down between the width of the door because you’re going to remove part of it later. Cut four pieces of wood the entire height between the top plate and the sole plate. These will be your king studs. Nail two king studs against the sides of the rough opening and between the plates. Install two more at a width that’s the new door’s width plus five inches. Next, cut two pieces of wood for your jack studs. Make sure these are the height of the new door plus 1 ½ inches. Nail the jack studs to the two inner king studs. 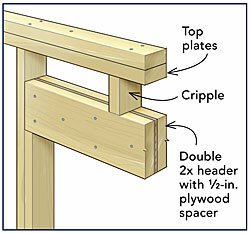 After that, create a header by cutting two pieces of wood to the same width as the jack studs and nailing them together. Then, nail the header to the jack studs. Next, you’ll need to cut one or two cripple studs that are the width between the header and the top plate. Nail your cripple studs in place. Use a saw to cut out the sole plate in between the jack studs. Now, you can install your new door.